Recently, I've noticed that lots of players who have been playing on servers with Slimefun were having trouble getting dusts to make alloys, since using a washer is the only way of getting them. Now with SlimefunOres, you can get dusts by breaking ores! CS-CoreLib and Slimefun must be installed for this plugin to work! Thank you for the 1000 Downloads! Thank you for the 5000 Downloads! From version 1.4, I added a new choosing algorithm because the liast one wasn't completely random. Basically, the old algorithm had an order going on like this (most common on left): Iron Dust > Gold Dust > Aluminum Dust > Copper Dust > Zinc Dust > Tin Dust > Magnesium Dust > Lead Dust > Silver Dust. This means that the iron dust and gold dust would be the most common to get, lead and silver the rarest. The new algorithm is completely random, which means that each dust has an equal chance of getting chosen. You can only get dusts if the ore you break hasn't been placed down and has been naturally generated. auto-update: true //Enable this if you want the plugin to get auto updated. old-algorithm: false //Enable this if you want to use the old dust choosing algorithm. tiny_uranium: false //Disabled by default. This plugin does not have any commands or permissions. The only thing you may want to edit is the config.yml file. All my Plugins are using an Auto-Updater to make sure, you're always using the latest and hopefully most bug free version of my Plugin. If you don't want this Plugin to be auto-updated, you can turn it off in the config file at "options -> auto-update: true/false"
Yup, you will always get the Ore you mined no matter what, but besides that, a piece of dust might drop on its location. 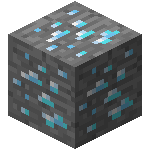 To clarify, the dust is included with the ore, not just replace it when the chance hits? This is epic! I will make you free art for this. Explanation: I make free art for the plugins I approve :3 just tell me if you want to see some examples of my work. Of course I will, it won't take that long to update it either. Will you update this to slimefun 4 in april?